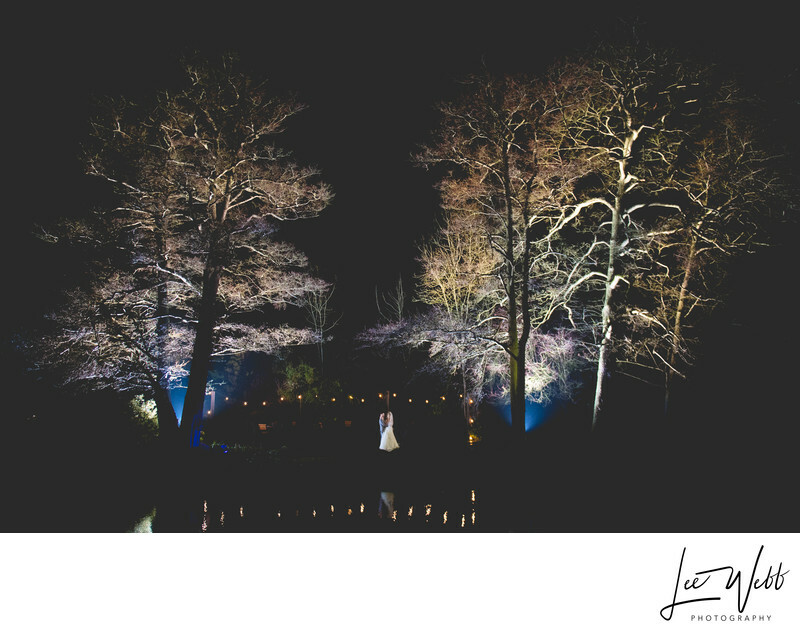 Jemma and Sean got married at the Mill Barns in Shropshire on Valentines day! The Mill Barns is a stunning, custom built wedding venue in the Shropshire countryside that has everything you could need from a wedding - from a stand-alone ceremony room to a cavernous reception barn too. I took this rather unique photo in the gardens, at the back of the wedding venue. All morning it had been snowing, and the temperature outside was hovering around 2 degrees Celsius. The bride and groom though were keen to make the most of their wedding day and the location to hand, so braved the freezing temperatures and had photos taken outdoors. This is one of my favourite photos from the wedding day itself. The trees at the back of the venue featured colourful uplighting which worked well for adding ambiance to the venue, but wasn't quite powerful enough for the image I was looking for. In order to enhance the look, I placed two off-camera speed lights beneath the trees, pointing directly upwards. These were triggered by the camera using a radio remote control. I made sure that enough of the light from the speedlights reached the bride and groom in order to sufficiently illuminate them in the otherwise dark scene. I think the effect is stunning, and is very different from anything else I've seen at the Mill Barns in the past. The venue is stunning and the staff were excellent, running a really tight ship! I look forward to the opportunity of working there again in future. To visit the Mill Barn's website, please click here. Location: The Mill Barns, Alveley, Near Bridgnorth, Shropshire, WV15 6HL.